Hitting the open road in hopes of finding something new is one of the best reasons for a great American road trip. It’s living for the moment, turning down a Two Lane country road, and discovering a town with an allure all its own. We’ve introduced you to some unique small towns in these pages, like Columbia, pictured above, but now we’re going to some places even smaller – tiny but mighty! Ride along with us as we take you to five communities with fewer than a thousand people but still guaranteed to pique your curiosity for your summer vacation itinerary or upcoming weekend plans. Tucked into the Flint Hills of the Breadbasket of America, Cottonwood Falls, Kansas is paved with cobblestone streets and populated with little bespoke businesses. The best way to make the most of your time here is to walk over to the local historical society for a custom tour of the town. 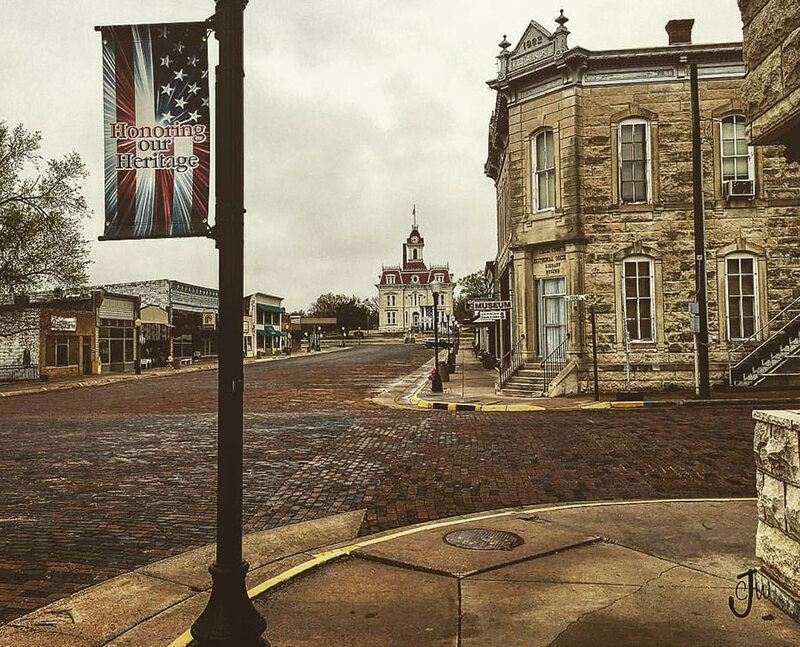 The most notable piece of architecture you’ll see is the 1873 limestone courthouse at the end of Main Street, honored to be on the National Register. And if you’re as interested in Mother Nature as you are in Lady Justice, grab some bait and find a sweet spot on the 109-acre Chase State fishing lake just outside town or drive over to the Tall Grass Prairie National Park to watch the bison roam! Watch out for the wild burros! They run free ’round this Old West town. These friendly little donkeys, once used for mining labor, were set free back in the 1920s after a fire shut down the mines for good. But they weren’t unemployed for long – they’re now the official Oatman Welcome Committee. When you arrive, you’ll feel like you’ve been transported onto the set of How The West Was Won, which happens to have been filmed here! 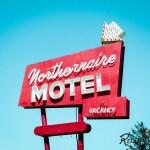 The 135 citizens of the town make their living selling handmade goods to travelers on Route 66. 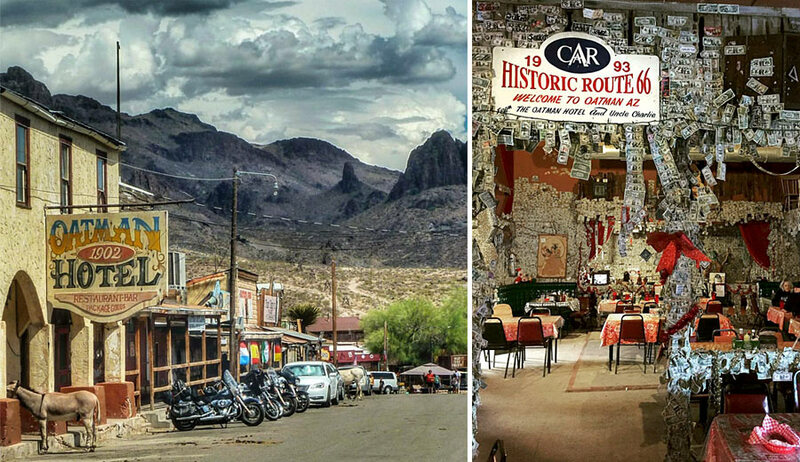 A must-see is the Oatman Hotel. Built in 1902, it’s the only two-story adobe structure in Mohave County and is listed on the National Register of Historic Places. Write your name on a dollar bill and tape it to the hotel’s restaurant wall while you wait for your homemade chili and fried bread to be served. Take in the magnificent sights of the Black Mountains and feel the freedom of the open range. 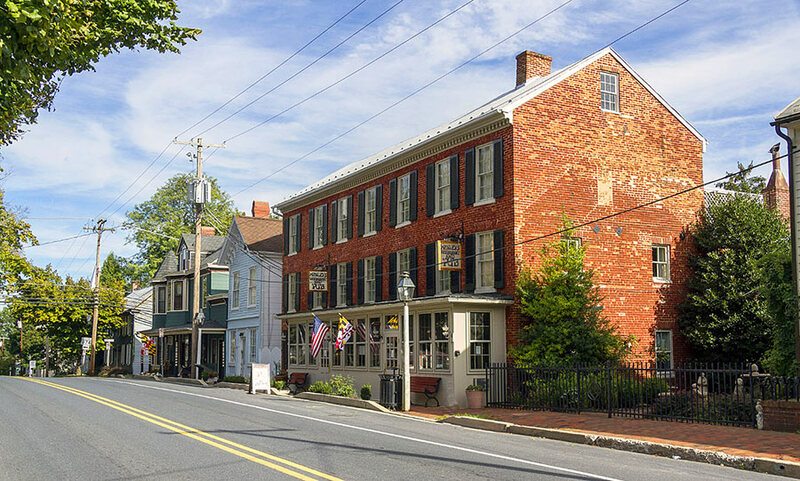 By 1818, New Market was a fundamental part of the western trade route because of its location near the National Turnpike, one of the well-traveled highways in early America. That meant there was a lot of dealing and trading going on between travelers. The bustling traffic of 200 years ago has quieted down a bit these days, but the people of New Market are still doing some picking of their own. 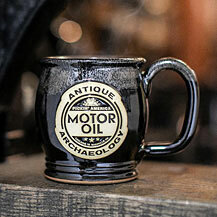 Their curated treasures tempt visitors to the town’s EIGHT antique shops. Antiques and crabcakes? We’ll start packing! And one more thing: if you’ve never experienced a white mid-Atlantic winter, plan your visit during the town’s 200-year-old “Christmas In New Market” festival! 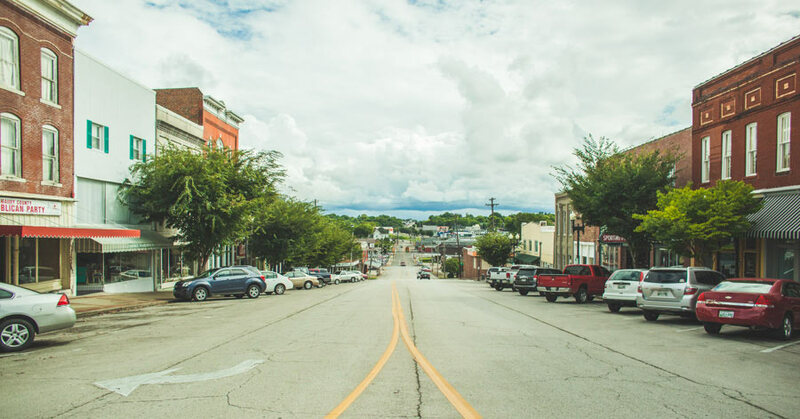 Named after the river that flows through it, Blackwater, Missouri is a Two Lane town that’s been pretty much under the radar, but we predict that’s about to change thanks to the determination of the community! Established in 1887, the town recently went through a Main Street revival process, (add comma) breathing new life into the buildings downtown. While you window shop, drop into the Iron Horse Hotel and Restaurant. Decorated with period furnishings, ornate wood, and ironwork, this place will transport you to days gone by. Take your kids to the 1907 brick building on the corner where inside you’ll find the Mid-Missouri Museum of Independent Telephone Pioneers. Go ahead and show them what communication was like before texting and Facetime. If you love trains, family-owned businesses, and mountains, head to Saluda! 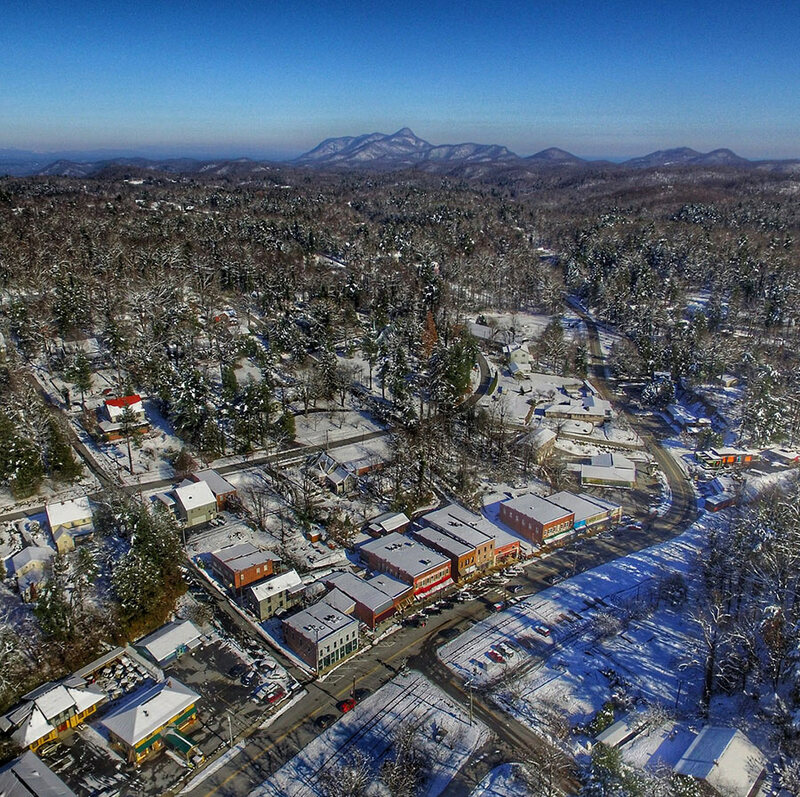 Located about an hour outside Asheville, it’s the only town in western North Carolina that is listed on the National Register of Historic Places. The railway history here dates back to 1878 when the steepest railway grade in America was built here. The Saluda Historic Depot even has a 19th-century caboose on display! Stop into Thompson’s, the oldest grocery store in the state, or drop by M.A. Pace, family-owned since 1889, for picnic supplies before heading to Pearson Falls to hike and cool off in the mist. We’d love to hear about the really small towns in your corner of the map. 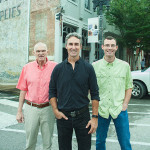 Tell us about them in the comments below so we can learn more about them and maybe even feature them in our next small town blog. 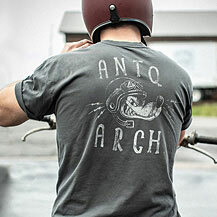 Inspired by the motor oil that fuels your Two Lane adventures! 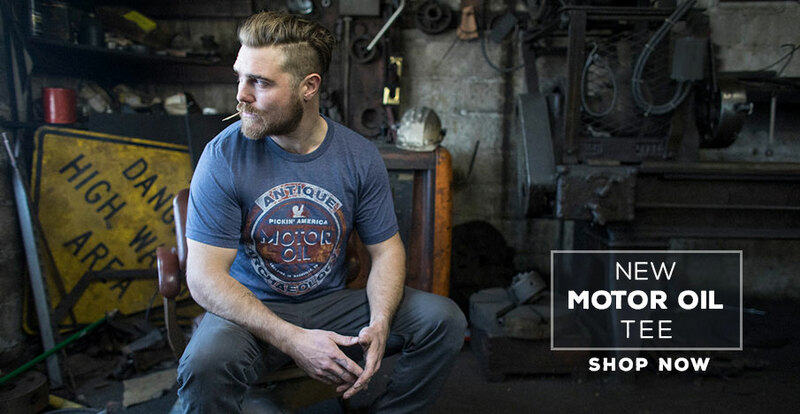 Get our NEW Motor Oil Tee! I purchased a “BERNIE” belt buckle in Oatman AZ. It’s the only time I’ve been able to find my name on anything. Great little town. FYI, Jello was created in Leroy, New York. There is even a small Jello museum in Leroy, NY.. Your show has grown to be an “good”addiction…❤️ It! 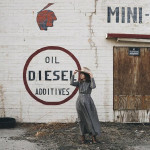 Re your Oatman piece… one of my travel favs! Local shopkeepers sell you little bales of alfalfa for the burrows who mosey throughout the little town. 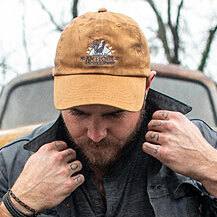 They have the Jerusalem cross on their backs too! All seem pretty well mannered but they enjoy the handouts! The hotel has a famous history of being Clark Gables & Carole Lombards honeymoon choice. I’m told they played poker and other card games with the locals into the wee morning! It’s also claimed to be haunted by the young newlyweds as giggles and laughter is heard coming from their honeymoon room! Another very interesting fact is that the town is named for Olive Oatman whose amazing story is captured in several books. Olive. As a child traveled by wagon west with her Mormon family. They were intercepted by Indians and most all killed but she and her sister captured and kept by the tribe. Her story is nothing short of amazing on so many levels! (Check it out). Again, love your show…..keep on going! You’re All Fun Folks! The wife and I both love the show, as it takes us back to our younger days. Our best friends always say that we grew up in the Norman Rockwell world, and I guess we did. 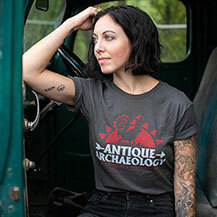 Much of what you find are items that our families and grandparents had. It makes us smile. Our son Jeff has made both of your stores a vacation destination and enjoyed them. In the fall, they even bought a old kiddie boat from a carnival ride to use as decor in their backyard. Keep up the great shows, and “Keep on pickin”. Check out Escalante, Utah, population 787. It is located on U.S. Scenic ByWay 12 between Bryce Canyon and Capitol Reef National Parks. The Byway between Escalante and Boulder is arguably the most beautiful and surreal road in the country. Just Google some images and you will be convinced. The town also boasts an airstream trailer park where you can spend the night in a restored airstream trailer in the middle of the Utah desert under the blanket of the milky way. At the airstream park, you can also watch a drive in movie under the stars while sitting in a restored 1950’s or 1960’s convertible. Nearby are some of the finest slot canyon and geological formations on Earth. This is still the true old west. My wife and I just moved from Tulsa, Ok to a small town in Southwest Iowa. Walnut, Iowa according to the sign as you enter, it states a population of 897 although I think it is currently around 750. It is deemed Antique City of Iowa. There are about 15 antique shops in town and they host a Father’s day weekend antique festival which I have heard brings in 30-50 thousand people. We are located less than an hour from Omaha, NE and a little over an hour from Des Moines, IA. I’m originally a West Virginia gal, now living in beautiful Pauline, SC. I’d like to mention my favorite SMALL TOWN, where I used to have a coffee shoppe………SISTERSVILLE, WV . Check it out…………….as the oil industry dried up in WV, this small town remains hauntingly beautiful with exquisite Victorian mansions and the Wells Inn. A must place for a story !!! Love you all !!! My kind of people, you are ! OK! We’ll take a look! What’s your favorite place in town? Ive been to sistersville. Across the ohio river from fly, ohio. Took the ferry across. on a small farm in pgh pa. and spent my younger years traveling the states living in steamboat spring and boulder and San Francisco in the early days, over 40 years ago, they were all small towns. spending time now farming raising animals and being a collector of unusual junque, love you guys keep it going and on the road. i would say Idaho is my favorite state along with colo. and the small towns back then. Where do I go to buy the stuff they pic ? I looked up Blackwater MO on a map. If you keep heading west on I 70 (state rate 40), turn right at the next ‘major’ roadway (Rte 65), and after you go through Marshall you’ll have to slow down or miss Malta Bend where my mother in law and my husband grew up. It’s a wonderful blip on the map, quite & serene and I love visiting with family. It was named after the ‘Malta’ which sunk at the bend in the Missouri River near there. By the way, the Malta has been found and they started digging it up last year. 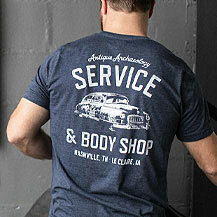 We’re heading out there in a few weeks, this time by car and stopping by your store in Nashville on our way back. My whole family loves your show! Discovered Blackwater MO two years ago while on a cross-country roadtrip. Great little town, very photogenic. As much as I try to do the “two lane” route, sometimes one has to sacrifice his self to the Interstate. Thankfully those brown highway signs advertising Historic Districts lead to some pretty cool discoveries; don’t miss them. Visited Oatman Arizona two years ago and we’re going back again this year. The story and sight of the wild burros is fascinating. They are wild but they are conditioned by their parents to come to town early in the day and stay until 4:00 pm before heading out into their desert homes. Be careful, they can bite and kick sometimes. The shops are quaint and unusual. A few shops still have hard packed mud for their floors. Prices for most items is very reasonable as they need to keep them that way to attract people 30 miles out into the desert. On our way out of town in the car with the windows up, we were going slow to avoid hitting the many burros in the street, when one came past my wife’s window, looked at it and proceeded to lick the window. We busted a gut and will always remember that. These out of the ordinary towns are terrific places to visit. The area of Waynesville, Mo. is on the Hwy 66 route and they are very proud of that. My story starts when the “Old Stage Coach Museum”. W.W. McDonald, found there were alot of McDonalds that were family of the W.W. McDonald. Fort Leonard Wood, by Waynesville, Mo. had a story in its self. Our family The McDonald goes back as far as 1784 in that area. Our Great Great Great Grandfather Archable McDonald was a very early pioneer in what now is Pulaskie County, Mo. His son James McDonald, also had children also has a great story, one daughter married Alexander Hamilton Wilare,(black smithman) w/Lewis and Clard, the other daughter married Henery Dodge, Wis. 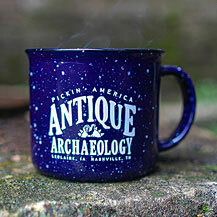 I have been in antiques for a few years and the stories kept with the item is so special. So know that there are many of us in TV land that apprieate your show with the thought also keep the history of your antiques. My hasban hs passed. So my Antiques packed away for a few year are now my quest to sale them. Most Neb., S.D. etc. Always ran out of money before going to the very East coast area. Which we hadn’t. It is a treasure trove. Good hunting and love your show. Love your show. Small towns are great . My Dad was from Clarkson Nebraska . They have Czech days there every June. My first time that I remember was this year. My mom told me we went when we were little. Lot of history in there history museum. My Great Grandfather owned Karel & Sons in Clarkson and Pilger from 1912 through to the 80’s. Super cool . Our family is in many places in that museum. The first place we ate at was a Pub in town,which happened to be the same location of my Great grandfathers business. You can still see the store name on the side of the building. Super, super cool to find out my family is a part of that history. You guys should check it out sometime. There is a (Very) small farming town near Blue Ridge, Georgia. If you sneeze, you will miss it. 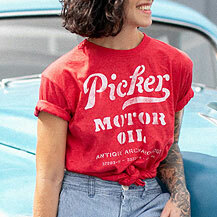 So, it is not necessarily a place many would want to visit but the Pickers may. There are several fields with old trucks rusting in the fields. May be a classic or two worth buying. P.S. The town is names Suches. Sorry for the omission. There is a (Very) small farming town near Blue Ridge, Georgia. If you sneeze, you will miss it. 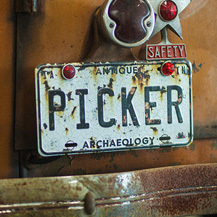 So, it is not necessarily a place many would want to visit but the Pickers may. There are several fields with old trucks rusting in the fields. May be a classic or two worth buying. Retired 5 years ago. Sold our acreage 2 yr ago and started traveling. LOVE it! Visited Williams, Az. in our travels and the people there are crazy fun! The train to the Grand Canyon gets “robbed” by the gunfighters from the shoot out at the corral just before the train leaves to go to the GC! It’s a very fun little town with campgrounds for travelers. Love watching you travel America! Wish I could attach a picture of my wife letting a wild “Oatman” donkey taking a carrot out of her mouth. We entered Oatman on the Old 66 route from Kingman. Wow! What a surprise when you go over the mountain range and enter Oatman. We didn’t know it even existed and it was a HUGE surprise. One of our favorite Road trip memories. Try visiting Gold Point, Nevada. Population about 10. My husband and I were married there. Over Memorial Day Weekend it comes to life with a celebration. Also on the day after Thanksgiving. Herb and Sandy also have cabins to rent out. These look like they were abandoned on the outside but the inside is quite nice. If you talk real nice you might get Herb to fix his Prime Rib dinner. His is the best ever. While in the area, check out Death Valley Jct. Marta Becket ran the hotel and theater for many years. She is now deceased but there is a lot of history in that town. It was built by the Borax Company for their workers. i have also been to Oatman, Arizona and love it. I have friends that live there and any excuse I can dream up takes me back there. Oatman is one of America’s little hidden treasures. Absolutely fell in love with this little mining town. Top 10 Memories. Oatman is an amazing little town l located on route 66. Check out Silver City New Mexico, a great place to pick. Happy Picking. John Mills Grand Forks B.C. Absolutely love the Fury Bros. candles. Best frangrance I’ve ever burned….and I am a old incense loving hippie! Will be ordering more. Old towns?……….When traveling through West Virginia ,my home state,you must visit SISTERSVILLE. It was a once booming oil town located along the Ohio River with very much wealth in the 20’s-30’s, glass manufacturing industries now gone, but it still boasts beautiful mansions, the Wells Inn, a Ferry, and a quaint little main street. It’s like time stands still in Sisterville. Less than 1400 residents and declining yearly. Keep up the good work of preserving America, one piece at a time ! My kind of people ! Love this show. My whole state (Montana) is small towns; many of the “blink-twice-and-you-missed-it” size. Keep up the good work, and if you ever find yourself in Big Sky Country, give me a holler! So happy to see you loved the town of Cottonwood Falls. The courthouse mentioned is the OLDEST continuous operating Courthouse west of the Mississippi. 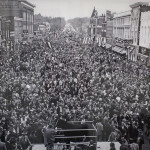 The area is FULL of history with limestone quarries that supplied the stone for many famous buildings including the State Capital building in Topeka Kansas and many in Washington DC. If you visit plan on spending at least a week to visit all the historical sites in the area. Needing quiet? There are numerous B&B in the area as well as some great fine dining. YES, FINE DINING. Come to Kansas and the Flint Hills and you will be tempted to spend the rest of your life there.